ACE Global Depository together with its group of associated and affiliated companies is carrying forward the business as first commenced in 1996, in Uganda. While ACE Global Depository has a firm presence in 46 countries through various affiliates, associates and approved agents, we have operated and provided expertise in over 76 countries and serviced 172 financial institutions. Operated in and provided expertise worldwide. Provides collateral control & custody services to 172 financial institutions. Holds in custody collateralized assets in excess of US$ 9 billion. Employs more than 4,800 employees. Banks and financial institutions in mitigating transactional risks inherent in financing local, regional and international trade. ACE GLOBAL Depository, commenced its operations in Uganda in 1996. 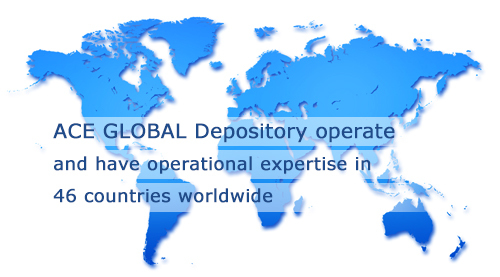 By the year end, ACE GLOBAL Depository, was present in 5 countries mainly in Southern and East Africa. Since 2009, ACE GLOBAL Depository, has further added 6 new country offices.